Thank you for joining us at Hike4Hope! It was a blessed event and the rainbows followed us as we hiked on Sunday, March 6 to fund a cure. We all know someone whose life has been affected by breast and/or gynecologic cancers. These are the women we love: our grandmothers, mothers, daughters, wives, sisters and our best friends. THANK YOU for being part of our 2016 Hike4Hope and part of a movement to help them live longer, healthier lives. City of Hope is leading the fight against cancers unique to women through research, treatment and education. Your commitment to HIKE4HOPE supports City of Hope’s efforts to push the boundaries of science to advance research and treatments on behalf of women everywhere. We would love to post your 2016 photos on our website. Please send photos to JFay@coh.org. If you file is large, please mail a disk to City of Hope, Attention: Hike for Hope/Joe Fay, 1500 E. Duarte Road, Duarte, CA 91010-3000. Thank you to all that raised additional funds for women’s cancer research and treatment! We are very apprecaitive of your efforts. It’s not too late to turn in donations. Please mail any donations to the address above and make sure to include your name so that we may credit you with raising these funds. We will be contacting those that qualified for Fundraising Rewards very soon. We've reached 77% of our $100,000 goal! 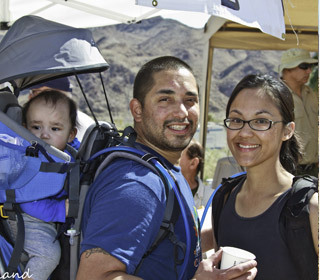 There's a Hike for Everyone! Easy to very strenuous, youth to senior, there's a hike for everyone. Check out the available hikes. Raise Funds and be Rewarded! Learn more about our exciting fundraising rewards!